So I'm off on my grand summer fiets tour of Zeeland. It's hot and I'm at the south bank of the Brielse Meer, a little west of the bridge to Rozenburg-Maassluis. In other words, going the opposite direction from my last trip to Zeeland. Another difference is that then it was overcast and chilly, today it is hot and sunny. The back of my neck is sweating. I sit at a picnic table alongside a canal where some pleasure craft are moored, 60ish couples with shirtless, paunchy guys skippering the boats, same sort who'd be RV'ing it in America. A bunch of boys claiming the bridge foundation as their diving platform. I'm a few miles from Brielle. I'll skirt the beachy perimeter of Voorne island and head for the evening's destination, Rockanje. I took the Sprinter from Muiderpoort station in Amsterdam to Rotterdam, changed for another to Maassluis. There I took the ferry across the Nieuwe Maas to Rozenburg and got disoriented in the suburban tangle of houses, soccer fields and schools. Finally I pulled up at the massive drawbridge, traversed it and two more bridges (to kp 30) over the maze of shipping lanes. The bike path holds its own amidst highways, railroad tracks and waterways--you thread through the industrial sprawl effortlessly and a sign informs you that you've arrived in Voorne-Putten (two islands that have somehow been sutured together). Stopped in Brielle and had a look around. An ancient gated town. Had an ice cream at a place called Tw'ice; looked at the massive fortress-like church built from thousands of bricks. Outside of Brielle, my bike started making an awful screeching creaking noise. Took off the panniers and rearranged them and the noise stopped. I realized I have no tools whatsoever. Then I was going by an endless summer community, Kruiningergors, and the path was crammed with oldsters on bikes. then crossed a road (to kp 51) and was up on a peaceful dike along the Oostvoornse Meer ("favored by divers for its depth (40m), visibility and shipwrecks at bottom, such as the Archimedes from 1839"). Took a bench facing the industry of Europoort across the lake. Smokestacks, cranes, eolic windmills. Soon the trail will meet the LF-1, then it's down through the dunes to Rockanje. I reached kp 1, which is where we meet the LF-1 and things are looking up. At this point the LF-1 turns into the dunes, emerging just north of Rockanje. (If you head northwest to kp 56 you go over a bridge to Maasvlakte/Europoort.) There is some kind of wetlands reserve at Slikken van Voorne, where birds nest in salt marshes. There are packed sand trails along the coast but I think I'll stick with the LF-1 (to kp 3->13->14) since my bike is creaking again and I'd like to get it to a repair shop. As soon as I got on the LF-1 the development ended and I was riding through beautiful, peaceful dune forest. It did not take long to reach Rockanje and I just headed straight for the beach. Here at the beach of Rockanje, fine sand littered with shells, grassy hillocks at the foot of dunes. Extremely mellow--a few restaurants at the top, one with what sounded like a live salsa group. Out here on the strand it is practically deserted and has a real castaway island feeling. The water is very calm--it does not feel like the open sea and when I swam around in it tasted no salt. You can see the long sweep of the dam (lined with eolic windmills) to the south that connects Voorne island to Goeree (Zeeland). It is a practically windless, cloudless day, around 75° F.
Else, my vriend op de fiets in Rockanje, laid down a number of laws right quick, including a complicated explanation of how to flush the toilet and dry off the shower, which made me reluctant to use them. Though she seemed somewhat exasperated, I like that she spoke to me in Dutch (though she offered to speak English). Prowling for supper in Rockanje, pickings seem slim. Else had warned me that the restaurants would close soon, so I washed my face and went out. I came over the central square and found a pizzeria/showarma joint. It's a bend in the road and cars come whipping around periodically, but also cyclists. Skateboarding kids around a circular garden add that patina of urban decay. Across the way is the standard crappy Chinese restaurant, Sun Garden. But this establishment is friendly enough and it's nice to have dinner outside. I'm glad I have a good book: My Ears Are Bent, by Joseph Mitchell, a collection of the New Yorker writer's early beat reporting in Harlem and Brooklyn in the 1930s, well-drawn portraits of seedy characters. Else's exasperation seemed to vanish after she'd had a couple of glasses of wine. I sat in her backyard while she watched a movie. The she came out to join me. She said I would've been better off, coming from Maassluis, to go through Maasvlakte, which is the recently completed industrial zone added to Europoort. It is, she said, a model of environmentally friendly industry, with nature reserves interspersed among the factories. Also a beach, only just recently created. 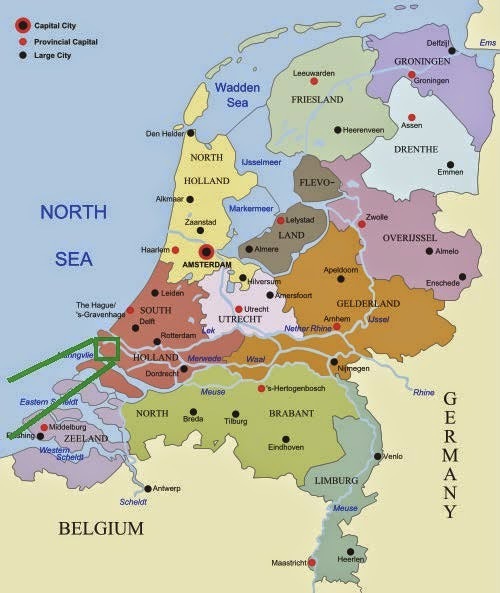 I toyed with the idea of going back home that way via Hoek van Holland but then decided to stick with my original plan.